“The piano, to me, represents something that has been around for several generations before our own. We’ve learned to speak in the language designed by these previous generations to say the things we want to say today. Meanwhile, the synthesizer is a new instrument, designed within the last few decades, and which continues to be refined to explore other thoughts we’ve yet to say. Having heard Kourosh’s previous work I was always interested with his musical approach and Live at Bliss Gardens does not deviate from that approach. I easily get lost in it (to the point that I place it on repeat listening to the album several times over), each song easily melts into the next, each track presenting a unique ripple. To say that I highly recommend this album is an understatement, this album is a must listen. I could continue speaking about the album, each individual song and my favorite parts, but as Kourosh had told me via e-mail in discussing his music, “I could wax on like this for quite some time. ” I could as well. 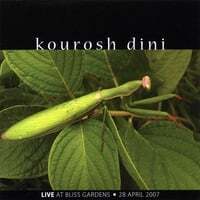 Live at Bliss Gardens is now available through Kourosh Dini’s website (www.kouroshdini.com) or through CD Baby. This entry was posted in Music and tagged Kourosh Dini, Music Review, Second Life. Bookmark the permalink. The piano, to me, represents something that has been around for several generations before our own.